A sick mouth can lead to a sick pet. 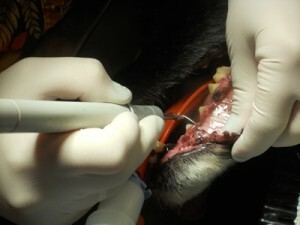 Dental disease is potentially one of the biggest problems for your pet. 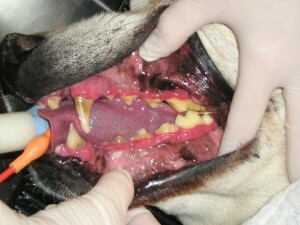 What we used to think of as “dog breath” is actually infections in the teeth and gums. We will examine your pet’s mouth to look for signs of dental disease such as red gums (gingivitis) heavy tarter, loose teeth and pus at the gum line. If your pet needs to have a dental procedure done we will give you a treatment plan and get your pet on our schedule. We will do an exam on your pet and review any blood work that was done. We can do blood work in the hospital if needed that same morning. Next we give your pet some pre-anesthetic drugs to make him relaxed and place an intravenous catheter so that he can get IV fluids during the dental. The fluids help maintain your pets blood pressure and speed recovery from the procedure. 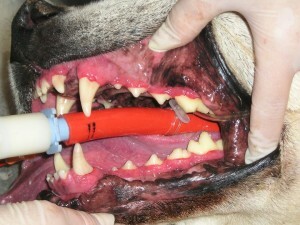 Anesthesia is maintained with a tube in your pet’s trachea. His blood pressure, heartrate and oxygen levels are monitored the entire time he is asleep. We use an ultrasonic scaler and dental equipment very similar to what your own dentist uses. We also can take dental x-rays if needed. If your pet needs an extraction we will use a local nerve block and gentle technique to cause as little trauma as possible. Dr. Soule had to remove 13 teeth from one poor little dog, but the next day the owners reported she was more frisky than she’d been for months. The poor little thing was in pain but didn’t let anyone know. Finally we polish and put fluoride on your pet’s teeth and wake him up. You get a pet with shiny white teeth back!